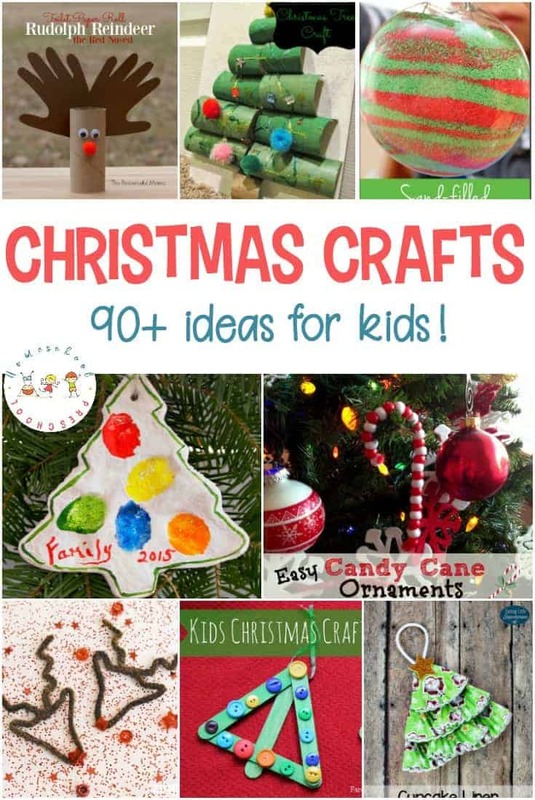 If you’re looking for some amazing Christmas crafts for kids to do this holiday season, I’ve got the perfect list for you! These Christmas crafts and activities are the perfect way to entertain your little ones through the month of December. Mommy’s Bundle loves angels, and she’s created a fun angel craft with simple household items. Be sure to check out her Santa, salt dough Christmas tree ornaments, and snowflake crafts, as well. Check out these crafts from Teaching 2 and 3 Year Old: snowflakes, gingerbread ornaments, and handprint fillable ornaments. If your littles ones like to finger paint, they’ll love these finger paint Christmas trees and gingerbread men from Mini Monets and Mommies. Montessori Nature has two handmade ornaments that also help little ones fine tune their fine motor skills. Check out these four handmade ornaments, too. These handmade cinnamon ornaments from Mosswood Connections offer an aromatic sensory experience for your little ones. Simple Fun for Kids shares how you can use wrapping paper scraps to make ornaments with your preschoolers. Her marbled Christmas trees look pretty fun, too. These Button Trees from Family Fun and Travel will look great on your Christmas tree. Kids’ Craft Room shares a fun handprint angel craft that will look great atop your mini Christmas trees. Her unique snowman ornament it pretty cute, too. 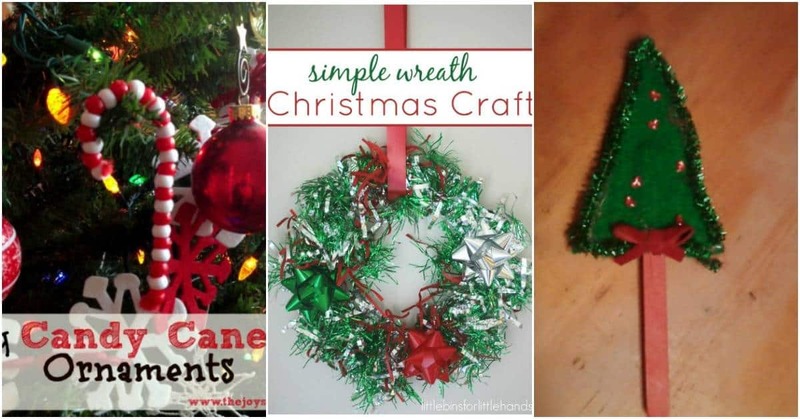 I love how Chaos and the Clutter uses household items to create one of a kind Christmas art projects. Who would have thought to use a dish brush and fingerprints? And, her Christmas Sticky Tree is a great way to keep the littles occupied on a cold winter afternoon. Danya Banya shares four ways preschoolers can decorate Christmas baubles. If you’re looking for a way to use up those perler beads , you can make these ornaments. Your little Frozen fans will absolutely love these Olaf cotton ball ornaments from Crafty Mama in Me. Make a stained glass wreath to hang in the window using this tutorial from In the Playroom. Here’s another festive wreath from Little Bins for Little Hands. My Bright Firefly shares some super cute storytelling ornaments she made based on a popular Christmas story! Salt dough ornaments are super easy for little hands to make. Mama Smiles shares her salt dough recipe and shows off her collection of pretty ornaments. Use toilet paper rolls to create Rudolph the Red-Nosed Reindeer, paper plates to create a Christmas wreath, and a styrofoam cup to make a Santa hat. Your kids will stay busy with these crafts from The Resourceful Mama. Polar Express is my all-time favorite Christmas music. If your little ones like that movie, they’ll love making their own Frozen Bell Ornaments to hang on the tree. 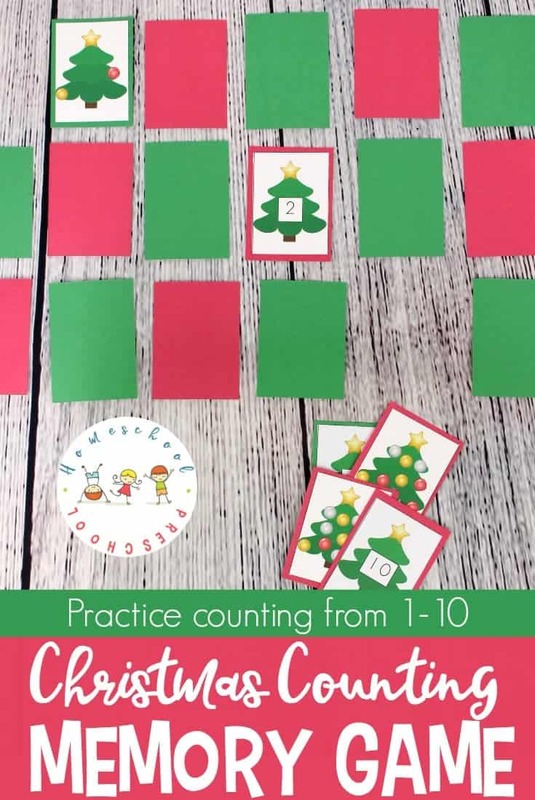 Over at Pleasantest Things, you can find a fun Christmas colors activity for toddlers, too. Grandparents love handmade gifts from their kiddos. These gingerbread stand-up cards from Red Ted Art are perfect for giving to loved ones. Be sure to check out the Santa Stars and mini Christmas trees and paper chains. Raising Little Superheroes shares how to make Christmas tree ornaments from cupcake liners. She also shares how to make toilet roll reindeer, tissue paper Christmas trees, and Christmas ornament sun catchers. Preserve your little ones’ hand and footprints with a cute little reindeer or angel from There’s Just One Mommy. You can also make a Christmas crocodile based on the book by the same name. 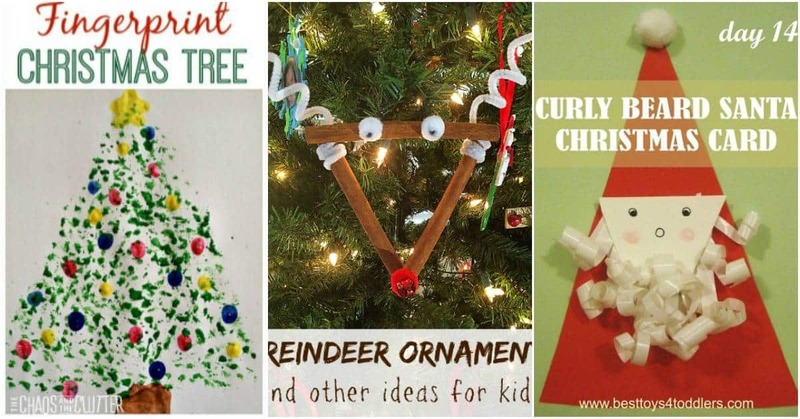 Littles ones can practice their shapes with these triangle Christmas crafts. School Time Snippets made a toilet paper tube Christmas tree that preschoolers will love. 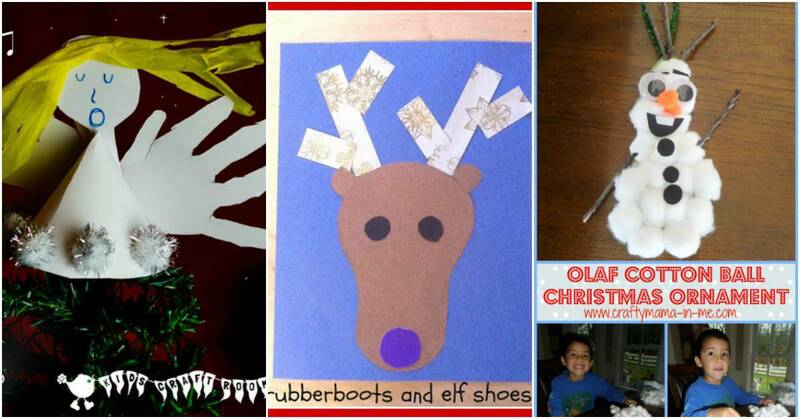 Wrapping paper scraps make great antlers on this fun reindeer craft from Rubberboots and Elf Shoes. Crayons make great picture frame ornaments. And, check out the cocoa salt dough recipe from Betsy’s Photography for some ornaments that will smell so yummy! Little ones will love these handmade Santa Hat and Easy Ribbon Tree Christmas cards from The Mad House. 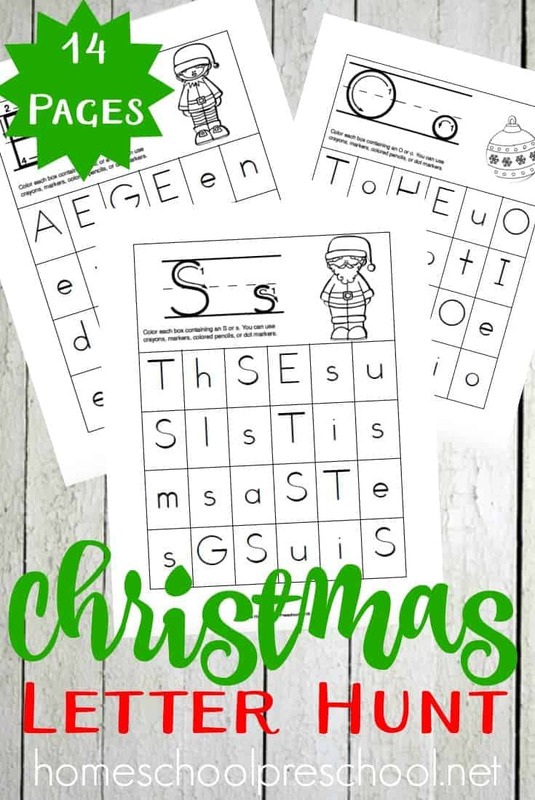 Sight and Sound Reading has a few fun printable packs your little ones will love: Gingerbread Man Cutout, Do You Want to Make a Santa?, and Do You Want to Build a Nativity? I remember making Candy Cane Mice like the ones shared at Playground Park Bench. Check out the Cinnamon Dough Ornaments, too. I like crafts that are versatile. This felt Christmas Tree from Kids Creative Chaos can be a pin or a magnet. It’s up to you. 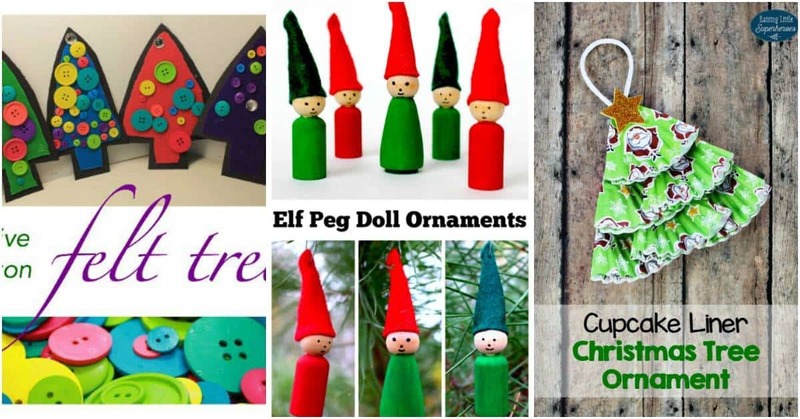 These Elf Peg Doll Ornaments from Rhythms of Play were inspired by the book The Christmas Wish . While you’re there, be sure to check out her rhinestone pinecones. My girly and I are all about the bling! The Typical Mom has a fun collection of ornaments that kids can makeincluding this cinnamon stick reindeer. 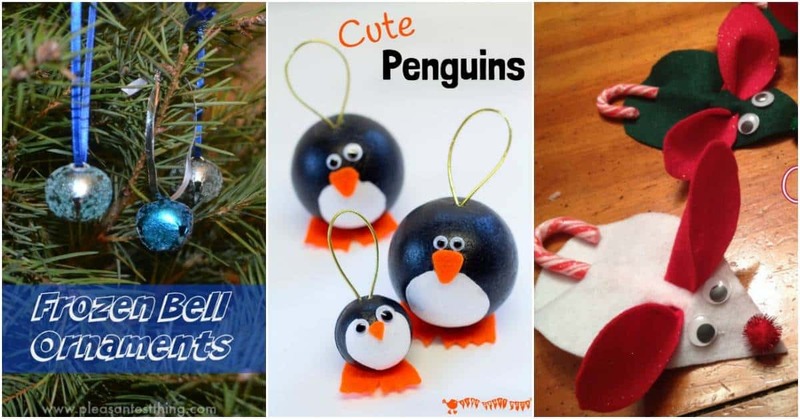 If your little one loves penguins as much as mine does, then you have to check out these penguin ornaments from Kids Craft Room. These will look great all winter long. Kid World Citizen has some multicultural Christmas crafts that your kids mayenjoy. Try out these stained glass windows and Ecuadorian “migajon” clay figures. You’re preschoolers can practice their cutting skills while they make these Christmas Trees from Crafts on Sea. While you’re on the site, be sure to check out her stained glass Christmas tree sun catchers and toddler-friendly Christmas lanterns. These Fingerprint Salt Dough Christmas Trees over at Easy Peasy and Fun will make wonderful keepsakes for years to come. 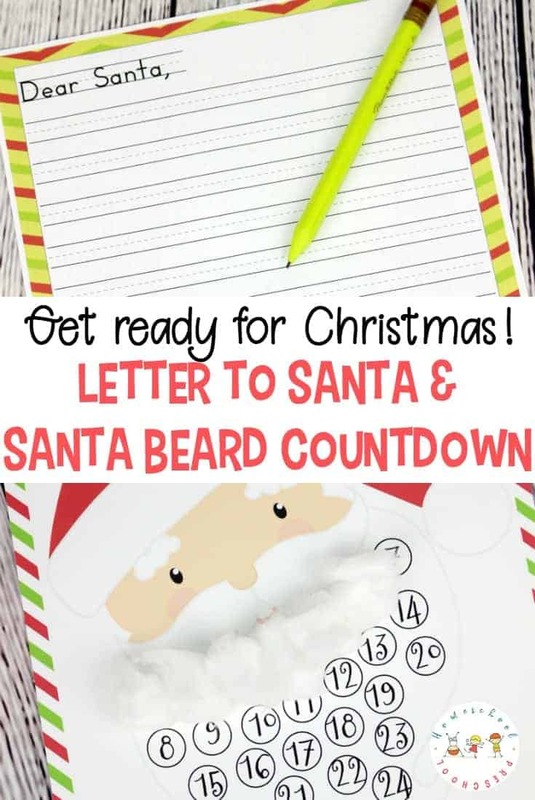 Best Toys 4 Toddlers has quite a collection of preschool Christmas crafts that include an Easy Torn-Paper Christmas Wreath, Colorful Pretend Christmas Cookies, Curly Santa Beard Christmas Card, Ribbon Collage Christmas Baubles Card, and a Confetti Christmas Wreath Card. Gift of Curiosity also has a collection of crafts for your preschoolers. 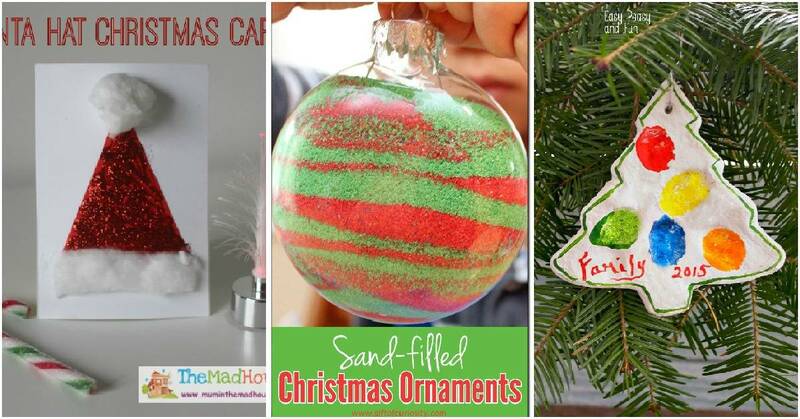 They include Christmas Fizzy Painting, Q-Tip Painted Christmas Tree, Christmas Tree Shapes Activity, Cinnamon Christmas Ornaments, Paper Plate Reindeer Crafts, and Sand-Filled Christmas Ornaments. The Joys of Boys shares Easy Candy Cane Ornaments along with Easy Jingle Bells. This Moon and Stars Mobile is a unique Christmas ornament from Hen Family. 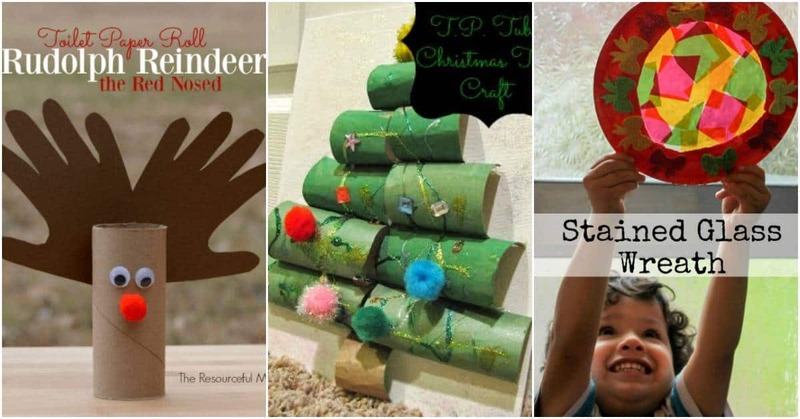 Mama’s Happy Hive shared 8 Montessori-inspired Christmas activities. Jennifer from The Jenny Evolution shares how to recycle old Christmas cards into a wonderful collage and how to use stickers and gems to create a one-of-a-kind Christmas wreath.